TechGlobeX would like to Congratulate Facebook's Chief Executive Officer and Co-Founder Mark Zuckerberg on his Wedding with his longtime girlfriend Priscilla Chan belongs to China. 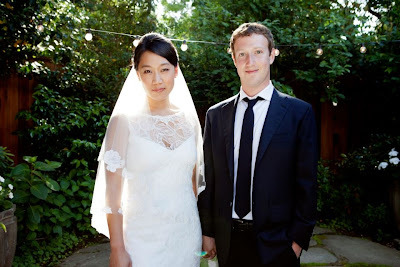 Mark Zuckerberg and Priscilla Chan marriage was a silent wedding party at Zuckerberg’s home and no huge people’s crowd and guests were invited into marriage ceremony but just a fewer than 100 guests thought they were there to celebrate Priscilla Chan’s graduation from medical school at the University of California, San Francisco. It’s been a pretty big week for Mark Zuckerberg who has also introduced Facebook IPO for general public two days back and also celebrated his birthdays which turned into 28 and today he got married. People got surprised when Mark Zuckerberg announced on his timeline on Saturday evening that he and longtime girlfriend Priscilla Chan are now husband and wife and also Zuckerberg and Chan changed their status from single to 'married'. Zuckerberg’s has also added the following event on his Facebook Timeline. Mark Zuckerberg added a life event to May 19, 2012 on his timeline: Married Priscilla Chan. Mark Zuckerberg and Priscilla Chan met at Harvard before the launched of Facebook and they have been together for over nine years and now they are lovely loving couples so let’s wish and Congratulate to the newly married couple for their future. You can see Mark Zuckerberg and Priscilla Chan Wedding Pic above.